What could be better than beef meatballs and bacon? These meatballs slathered in bourbon sauce will be a hit at your next party. Heat oven to 400°F. Place uncooked bacon and onion into a food processor and chop until bacon and onion are finely ground. Combine ground beef, bacon and onion mixture, bread crumbs, egg, parsley, chili poser and salt in large bowl, mixing lightly, but thoroughly. Shape into 24 1-inch meatballs. Place on rack in broiler pan that has been sprayed with cooking spray. Bake in 400°F oven 15 minutes. Combine the barbecue sauce, water and bourbon in a saucepan and heat. Stir to mix the sauce together. Add in the cooked meatballs and allow them to simmer in the sauce before serving. 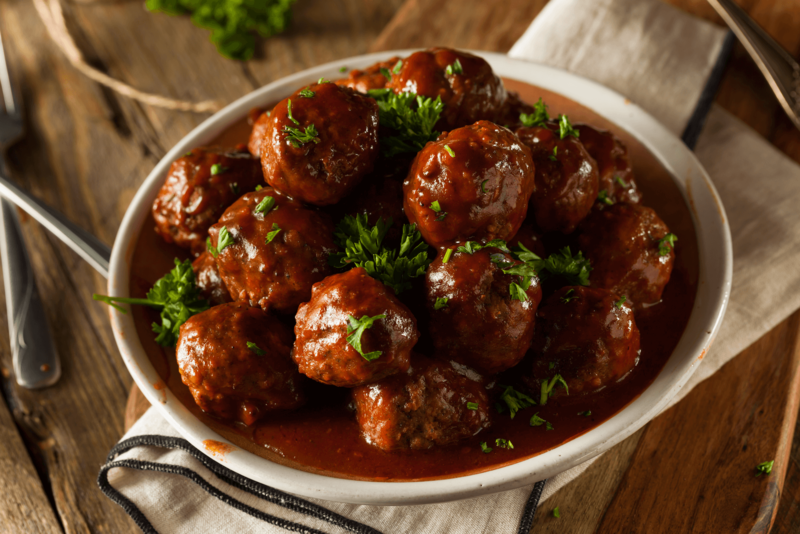 If serving for a crowd, the meatballs can be placed in a slowcooker to keep warm.